It has been six years since the first Shoreline Management Plan (SMP) was implemented, which means that FirstLight has created a new draft SMP that is currently up for review. This document affects all the residents with property around the lake, as well as those who care for the lake's health. The final version of the new SMP will be submitted by March 27th, 2019. 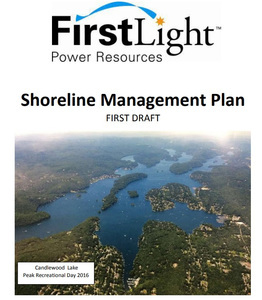 We urge the public, as well as the municipalities and any other interested organizations to review and compare this new draft document with the current SMP to prepare for the public hearing that FirstLight will hold. To find out more about what an SMP is, read below.